Corrosion-under-insulation (CUI) refers to the external corrosion of piping and vessels that occurs underneath externally clad/jacketed insulation as a result of the penetration of water. By its very nature CUI tends to remain undetected until the insulation and cladding/jacketing is removed to allow inspection or when leaks occur. CUI is a common problem shared by the refining, petrochemical, power, industrial, onshore and offshore industries. In the first edition of this book published in 2008, the EFC Working Parties WP13 and WP15 engaged together to provide guidelines on managing CUI with contributions from a number of European refining, petrochemical and offshore companies. The guidelines are intended for use on all plants and installation that contain insulated vessels, piping and equipment. 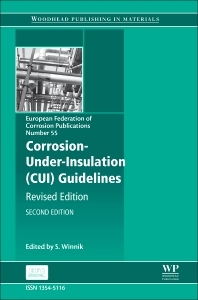 The guidelines cover a risk-based inspection methodology for CUI, inspection techniques and recommended best practice for mitigating CUI, including design of plant and equipment, coatings and the use of thermal spray techniques, types of insulation, cladding/jacketing materials and protection guards. The guidelines also include case studies. The original document first published in 2008 was very successful and provided an important resource in the continuing battle to mitigate CUI. Many members of the EFC corrosion community requested an update and this has taken between 18-24 months to do so. Hopefully this revised document will continue to serve the community providing a practical source of information on how to monitor and manage insulated systems. Dr Stefan Winnik is Managing Director of SW Materials and Corrosion Ltd.; he was formerly with the ExxonMobil chemical company in the UK.